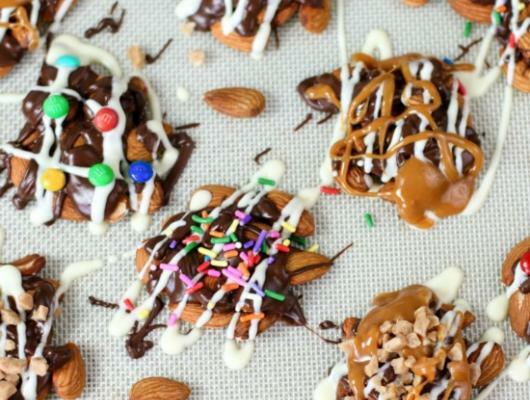 Optional Toppings include: Melted white chocolate drizzle, melted caramel drizzle, toffee pieces, sprinkles or M&M’s. Line a baking sheet with parchment paper or a Silpat silicone baking mat. Place 8 to 10 almonds in a small pile on the baking sheet (see picture above). Melt the chocolate and coconut oil in a double boiler or use the microwave (carefully). For the microwave, place the chocolate in a medium microwave safe bowl. Melt in 30 second increments on 50% power, stirring after each increment until completely melted and smooth. Cool 2 minutes (for a shiny finish). Using a teaspoon, carefully drizzle the chocolate over the almond clusters. Additional sprinkles are optional, but highly recommended! Put them on now, if desired. Allow clusters to cool completely. Refrigerate at least 20 minutes or until set. Store chilled in an airtight container. 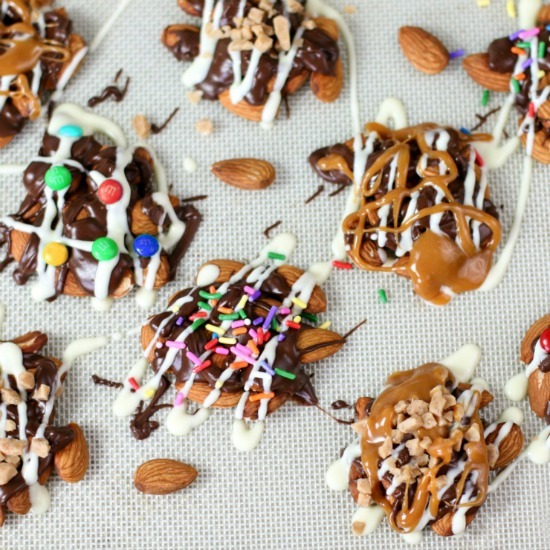 Creamy, melt-in-your mouth addicting 123 Heavenly Nibbles are chocolate almond clusters made in the microwave with just 3 simple ingredients (and the 3rd one isn’t salt)!